ANGPTL8 is a circulatory hormone secreted from liver and adipose tissue that promotes pancreatic beta cell proliferation and interferes with triacylglycerol metabolism in mice. The clinical significance of its effects on inducing beta cell proliferation is limited because it causes severe hypertriacylglycerolaemia. We employed ultrasound-targeted microbubble destruction (UTMD) to deliver human ANGPTL8 gene plasmids to the pancreas, liver and skeletal muscle of normal adult rats. Human ANGPTL8 was consistently detected in the circulation 1 month after UTMD. ANGPTL8 gene delivery promoted the proliferation of adult and aged beta cells, expanded the beta cell mass, improved glucose tolerance and increased the fasting blood insulin level after UTMD treatment without causing severe hypertriacylglycerolaemia. ANGPTL8 gene therapy significantly alleviated but did not totally reverse STZ-induced diabetes in a rat model. ANGPTL8 induced adult and aged beta cell regeneration in a rat model. Pancreatic beta cell regeneration is an ideal way to recover beta cell mass for the reversal of diabetes. Two main pathways have been proposed for expanding the beta cell mass in adults [1, 2, 3, 4, 5]. The first is beta cell regeneration, which involves the replication of pre-existing beta cells in the pancreas. The other is beta cell neogenesis, in which beta cells are derived from either pancreatic endocrine progenitor cells or the reprogramming of endocrine alpha cells or pancreatic exocrine cells to produce insulin. After birth, low levels of beta cell replication or duplication appear to be the dominant pathway to maintain beta cell mass. However, to date, there has not yet been a successful application of drugs, proteins or genes to diabetic patients to produce therapeutic beta cell regeneration. It has recently been reported that betatrophin, also called angiopoietin-like protein 8 (ANGPTL8), is a hormone regulated by lipid metabolism that inhibits liver lipoprotein lipase and significantly increases serum triacylglycerol levels in mice [6, 7, 8, 9, 10, 11]. A 596 bp ANGPTL8 cDNA was produced with a short secret sequence in the N-terminus that is highly enriched in the liver and adipocytes . Yi et al  found that a hepatic overexpression of Angptl8 (also known as C19orf80) after a hydrodynamic injection of non-viral sleeping beauty transposon plasmids into the tail vein of adult mice had several effects: it stimulated the proliferation of pancreatic beta cells, increased insulin secretion, improved glucose tolerance and expanded the mass of the beta cell islets. However, no independent investigators have confirmed the pancreatic beta cell proliferation induced by ANGPTL8 , and the clinical significance of its effects on inducing beta cell proliferation is limited because it causes severe hypertriacylglycerolaemia. Targeting ANGPTL8 to pancreatic beta cells while avoiding uptake in the liver offers a possible solution for regenerating beta cells without causing hypertriacylglycerolaemia. Our group developed a novel approach to gene therapy by targeting the delivery of non-viral DNA to the pancreatic islets using ultrasound-targeted microbubble destruction (UTMD) and a modified insulin promoter [14, 15, 16, 17, 18, 19, 20]. In this study, we employed UTMD to deliver the ANGPTL8 gene to the liver, skeletal muscle and pancreas of normal rats and compared the efficiency of beta cell proliferation induced by ANGPTL8 using the rat model of STZ-induced diabetes. Animal studies were performed according to National Institutes of Health (NIH) recommendations and approved by our institutional animal research committee. Adult male Sprague–Dawley rats (3 months old or 18 months old) were purchased from Harlan Laboratories (Indianapolis, IN, USA). In animal protocol 1, normal adult male rats (3 months old, n = 18) received one of three treatments: (1) no treatment (normal control rats, n = 6); (2) UTMD with the plasmid pXL-BASII-CI-DsRed/pCI-hyPB (n = 6); or (3) UTMD with pXL-BASII-CI-ANGPTL8/pCI-hyPB (n = 6). The UTMD was targeted to the liver and all the rats were killed 4 weeks after UTMD. In animal protocol 2, normal adult male rats (3 months old, n = 18) received one of three treatments: (1) no treatment (normal control rats, n = 6); (2) UTMD with pXL-BASII-CI-DsRed/pCI-hyPB (n = 6); or (3) UTMD with pXL-BASII-CI-ANGPTL8/pCI-hyPB (n = 6). UTMD was targeted to the left quadriceps skeletal muscle and all the rats were killed 4 weeks after UTMD. In animal protocol 3, normal adult male rats (3 months old, n = 18) received one of three treatments: (1) no treatment (normal control rats, n = 6); (2) UTMD with pRIP3.1-DsRed (n = 6); or (3) UTMD with pRIP3.1-ANGPTL8 (n = 6). UTMD was targeted to the pancreas and all the rats were killed 4 weeks after UTMD. In animal protocol 4, aged male rats (18 months old, n = 12) received one of two treatments: (1) UTMD with pRIP3.1-DsRed (n = 6); or (2) UTMD with pRIP3.1-ANGPTL8 (n = 6). UTMD was targeted to the pancreas. In animal protocol 5, normal adult male rats (3 months old, n = 24) received one of four treatments involving (1) no treatment (normal control rats, n = 6) or (2–4) streptozotocin (STZ)-induced diabetes (80 mg/kg i.p. ; Sigma, St Louis, MO, USA). The fasting blood glucose of all the STZ rats was above 13.88 mmol/l. The STZ diabetic rats in protocol 5 were divided into the following groups: (2) UTMD with pRIP3.1-DsRed (n = 6); (3) UTMD with pRIP3.1-ANGPTL8 (n = 6) targeted to the pancreas; and (4) UTMD with pXL-BASII-CI-ANGPTL8/pCI-hyPB (n = 6) targeted to the liver. All the rats were killed 4 weeks after UTMD. Rats were anaesthetised with i.p. ketamine (100 mg/kg) and xylazine (5 mg/kg). A polyethylene tube (PE 50; Becton Dickinson, Franklin Lakes, NJ, USA) was inserted into the right internal jugular vein. The anterior abdomen was shaved, and an S3 probe (Sonos 5500; Philips Ultrasound, Andover, MA, USA) was placed to image the pancreas, liver or left quadriceps skeletal muscle and clamped in place. Plasmid DNA containing the reporter gene DsRed or the ANGPTL8 gene under the regulation of either CMV or RIP was incorporated within the phospholipid shell of gas-filled microbubbles (1 ml), which were infused for 5 min. Ultrasound was directed at the target organ to destroy the microbubbles using the ultraharmonic mode (transmit 1.3 MHz_receive 3.6 MHz) and a mechanical index of 1.2–1.4. Lipid-stabilised microbubbles were made as previously described . Briefly, 250 mg of 1,2-dipalmitoyl-sn-glycero-3-phosphocholine, 50 mg of 1,2-dipalmitoyl-sn-glycero-3-phosphoethanolamine and 10% glucose were mixed with PBS and boiled in water until fully dissolved. Next 2 mg of plasmid DNA was mixed with 0.5 ml of ethyl alcohol and centrifuged at 10,000 g for 5 min. The supernatant fraction was removed, and the DNA pellet was placed in an incubator at 37°C for 5 min to remove any remaining ethyl alcohol. The DNA was then added to 50 μl of Lipofectamine 2000 (1 mg/ml; Invitrogen, Carlsbad, CA, USA) and mixed for 20 min. This mixture was added to 250 μl of liposome solution, 5 μl of 10% albumin and 50 μl of glycerol (10 mg/ml) in 1.5 ml vials, and placed on ice. The headspace of the vials was filled with perfluoropropane gas, and the vials were then shaken for 30 min at 4°C. The mean diameter and concentration of the microbubbles were 1.9 ± 0.2 μm and 5.2 ± 0.3 × 109 bubbles per ml, respectively. The concentration of plasmid carried by the microbubbles was 250 ± 10 μg/ml. A rat insulin promoter (RIP) spanning nucleotides −412 to +155 was isolated and inserted into the plasmids. This 567 bp fragment containing exon 1, intron 1 and 3 bp (GTC) of the 5′ end of exon 2 was amplified by PCR from Sprague–Dawley rat DNA using XhoI and EcoRI primers. The corresponding PCR products were verified by agarose gel electrophoresis, and the gene sequences were confirmed by direct sequencing using standard techniques. The PCR-amplified fragments were digested with XhoI and EcoRI and then ligated into the XhoI–EcoRI sites of pDsRed–Express 1, a promoterless DsRed plasmid (BD Biosciences) and human ANGPTL8 cDNA with Sal1/Not1 cutting sites (Integrated DNA Technologies, Coralville, IA, USA). Cloning, isolation and purification of the plasmids were performed by standard procedures, and the PCR products were sequenced to confirm that no artefactual mutations were present. PiggyBac transposon plasmids (pXL-BSII donor plasmid) were provided by M. J. Fraser at the University of Notre Dame (Notre Dame, IN, USA)  and hyperactive piggyBac transposase helper plasmid was provided by A. Bradley at the Wellcome Trust Sanger Institute (Cambridge, UK) . Tissue samples were fixed in 4% paraformaldehyde and 20% sucrose overnight at 4°C, and cryostat sections 5–8 μm in thickness were then prepared. Sections were blocked with 20% Aquablock solution (EastCoast Bio, North Berwick, ME, USA) at room temperature for 1 h and washed with PBS. Guinea pig anti-insulin antibody at 1:100 dilution, rabbit anti-Ki-67 at 1:200 dilution, rabbit anti-human ANGPTL8 at 1:100 dilution (Abcam, Cambridge, MA, USA), mouse anti-human ANGPTL8 1:200 dilution (Phoenix Pharmaceuticals, Burlingame, CA, USA), mouse anti-proliferating cell nuclear antigen (PCNA) 1:50 dilution (Dako, Carpinteria, CA, USA), mouse anti-glucagon 1:2,000 (Sigma) and rabbit anti-amylase 1:100 dilution (Santa Cruz, Dallas, TX, USA) were added, and the samples were incubated overnight at 4°C. After washing with PBS, the secondary antibodies anti-mouse lgG conjugated with FITC, anti-guinea pig IgG-conjugated with Texas Red and anti-rabbit lgG conjugated with Cy5 (1:250 dilution in block solution; Abcam) were added, and the samples were incubated for 1 h at room temperature. The sections were rinsed with PBS, incubated with DAPI (Invitrogen), washed and mounted. The percentage of Ki-67- or PCNA-positive beta cells was calculated as the ratio of Ki-67- or PCNA-positive beta cells to the total number of beta cells on six consecutive pancreatic slides from each rat. Fasting venous blood was collected in EDTA tubes from the tail vein, and plasma lipids were measured using standard enzymatic assays. Human ANGPTL8 was measured using ELISA (Phoenix Pharmaceuticals) . Total RNA was isolated from 100 mg of pancreas, liver and left quadriceps skeletal muscle using the RNeasy mini kit (Qiagen). Real-time quantitative RT-PCR (qRT-PCR) analysis was performed on an ABI 7700 Sequence Detector (Applied Biosystems, Grand Island, NY, USA) using SYBR Green (RT2 SYBR Green qPCR Kit; Qiagen, Boston, MA, USA). Data were normalised to the expression of housekeeping genes (as an endogenous control). Changes in gene expression were normalised to control pancreas, liver and left quadriceps skeletal muscle samples. Total protein extracts from pancreatic, liver and muscle tissue were evaluated with a Cytoplasmic Extraction Kit (Thermo Scientific, Rockford, IL, USA). Protein concentrations were determined using the BCA-200 Protein Assay kit (Pierce, Grand Island, NY, USA); equal amounts of protein were separated by SDS-PAGE to nitrocellulose membranes and incubated with primary antibodies to ANGPTL8 (1:1,000 dilutions) and actin (1: 2,000 dilutions). Horseradish peroxidase secondary antibodies were used, and chemiluminescence was determined using the SuperSignal West Dura detection system (Pierce); a cytoplasmic marker (actin) was used to confirm equal loading. All western blots were performed in duplicate. The beta cell fraction was evaluated using the method of Terauchi et al . Images from six consecutive pancreas sections were captured by a digital imaging system, and the total areas of islet beta cells and the total area of whole pancreas were measured using NIH ImageJ software (NIH, Bethesda, MD, USA). The beta cell fraction was calculated as the percentage of the total area of beta cells to the total area of whole pancreas for six consecutive pancreatic slides from each rat. Data were analysed using Statview software (SAS, Cary, NC, USA). The values are presented as mean ± SEM. Differences were analysed by repeated measures ANOVA with Fisher’s post hoc test and were considered significant at p < 0.05. Figure 1 shows that human ANGPTL8 signal was detected in pancreatic islets cells in UTMD-pRIP3.1-ANGPTL8 delivered to the pancreas (Fig. 1d) but was not detected in the UTMD-pRIP3.1-DsRed gene control group (Fig. 1c). Human ANGPTL8 signal was detected in the cytoplasm of liver cells (Fig. 1b) and skeletal muscle cells (Fig. 1f) 4 weeks after delivery of the ANGPTL8 gene to liver and skeletal muscle by UTMD. Figure 1g shows fasting plasma levels of human ANGPTL8 in rats. In the normal and DsRed reporter gene control rat groups, no human ANGPTL8 was detected in fasting plasma. However, in the treatment groups, human ANGPTL8 was detected in fasting plasma from day 1 to day 28 after UTMD. Interestingly, the level of human ANGPTL8 in the liver and in the skeletal muscle groups targeted by UTMD was significantly higher than in pancreas targeted by UTMD. We further evaluated human ANGPTL8 mRNA levels using qRT-PCR. The results (Fig. 1g) showed that human ANGPTL8 mRNA levels after UTMD-ANGPTL8 for the pancreas, liver and muscle groups were 16.9 ± 4.4, 48.7 ± 11.2 and 27 ± 8 fold greater, respectively, than for the normal and UTMD-DsRed control groups (p < 0.001). Western blotting was employed to detect human ANGPTL8 from pancreas, liver and muscle protein extracts, and the results showed that the human ANGPTL8 signal existed in the pancreas, liver and muscle protein extracts after UTMD-ANGPTL8 gene delivery (Fig. 1h). We further investigated whether the delivery of ANGPTL8 would trigger the proliferation of pancreatic beta cells in normal adult rats aged 3 months. Ki-67-positive beta cells were not seen in the normal control group (images not shown) and the UTMD-DsRed reporter gene control groups (Fig. 2a, c, e). However, Ki-67-positive beta cells were seen in the ANGPTL8-treated groups (Fig. 2b, d, f). Figure 2g shows that the percentage of Ki-67-positive beta cells in UTMD-ANGPTL8 in the pancreas, liver and skeletal muscle groups was 7.24 ± 2.49, 5.49 ± 2.01 and 4.56 ± 2.33, respectively (p < 0.001 vs the UTMD-DsRed control groups and normal control groups). We wondered whether ANGPTL8 would also induce non-islet cell proliferation in pancreatic tissue. Figure 2h clearly shows that the percentage of Ki-67-positive pancreatic acinar cells was not significantly increased after UTMD-ANGPTL8 gene delivery (p > 0.05) relative to controls. In addition, we investigated whether or not the ANGPTL8 gene would proliferate in aged pancreatic islets beta cells. For the UTMD gene therapy in these experiments, we used 18-month-old (aged) rats. Figure 3 shows that the percentage of Ki-67-positive beta cells in the aged rat group was significantly less than that in the adult (3 months old) rat group (p < 0.001), although it was greater than for the UTMD-DsRed group (p < 0.05). We then used the beta cell-specific proliferation marker PCNA to demonstrate that these adult beta cells were proliferating. Figure 4 shows that PCNA was seen in the nuclei of the beta cells in the ANGPTL8-treated groups (Fig. 4b, d, f). Figure 4g shows that percentage of PCNA-positive beta cells in UTMD-ANGPTL8 in the pancreas, liver and skeletal muscle groups was 1.99 ± 0.67, 1.21 ± 0.61 and 0.92 ± 0.43, respectively (p < 0.001 vs the UTMD-DsRed control groups and normal control groups). Figure 5b, f, g shows that ANGPTL8 gene delivery expanded the size and number of beta cell islets in comparison with DsRed reporter gene delivery (Fig. 5a, e, i). The percentages of beta cells (Fig. 4h) after UTMD-ANGPTL8 targeted to the pancreas, liver and skeletal muscle were 2.21, 2.11 and 2.09 (p < 0.05 vs UTMD-DsRed controls, which had percentages of 1.61, 1.54 and 1.51). GTTs (Fig. 5c, g, k) in the groups that received UTMD-ANGPTL8 targeted to the pancreas, liver and muscle were significantly improved at the peak site on the GTT curve (30 min post i.p. glucose) (p < 0.05 vs control groups). Fasting plasma insulin levels in the UTMD-ANGPTL8 pancreas, liver and muscle groups were increased (p < 0.05 vs control groups). These data clearly indicate that the increase in beta cell mass, the improvement in glucose tolerance and the increase in fasting plasma insulin levels were directly related to the proliferation of beta cells that was induced by ANGPTL8 therapy. We also investigated whether the UTMD delivery of ANGPTL8 would interfere with lipid metabolism. Figure 6 shows that ANGPTL8 targeted to liver and skeletal muscle by UTMD caused severe hypertriacylglycerolaemia. However, when ANGPTL8 was targeted to the pancreas, hypertriacylglycerolaemia was not seen. ANGPTL8 therapy did not interfere with blood cholesterol level in any group (data not shown). Taking these results together, the approach of targeting ANGPTL8 to the pancreatic islets results in beta cell regeneration without hypertriacylglycerolaemia. There are no reports of ANGPTL8 being successfully used to treat animal models of diabetes. We injected STZ at a dose of 80 mg/kg i.p. 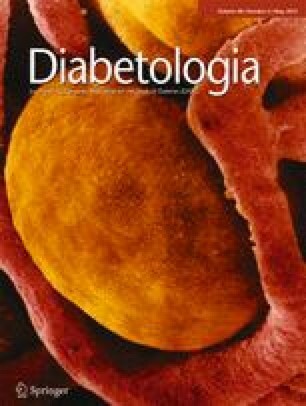 to 3-month-old fasting male rats and confirmed them as having diabetes by a fasting blood glucose level of over 13.88 mmol/l at 48 h after STZ injection. We then performed UTMD-pXL-BSII-CI-ANGPTL8/hyPB therapy targeted to the liver or pRIP3.1-ANGPTL8 targeted to the pancreas. Figure 7 shows that both ANGPTL8 treatment groups showed a significantly lower fasting blood glucose level compared with the STZ plus UTMD-DsRed control group, but they remained diabetic compared with normal controls (Fig. 7e). Only when ANGPTL8 was targeted to the pancreas did the fasting plasma insulin level increase (Fig. 7f), although not to normal levels. Figure 7a–d shows that, under diabetic conditions, ANGPTL8 regenerated beta cells to a modest degree. Although we observed Ki-67-positive nuclei in some residual beta cells in the pancreases of diabetic rats after UTMD-ANGPTL8 delivery (Fig. 8), STZ-induced diabetes was overall not totally reversed but only partially alleviated by ANGPTL8 delivery. Yi et al  reported that the delivery of ANGPTL8 by non-viral sleeping beauty transposon gene delivery plasmids to mouse liver stimulated beta cell expansion and enhanced glucose clearance. These results suggest that ANGPTL8 is a liver-derived circulating hormone that triggers compensatory beta cell proliferation when insulin resistance develops. Subsequent work from other laboratories has not confirmed a physiological role for ANGPTL8 in expansion of the beta cell mass. Wang et al reported that mice lacking Angptl8 showed normal glucose homeostasis . Jiao et al reported that elevated mouse hepatic Angptl8 does not increase human beta cell islet replication in a transplantation model [24, 25]. The two reports provided negative evidence for a physiological role of ANGPTL8 in mouse beta cell function or a pharmacological role of mouse Angptl8 in human beta cells. The current study was performed to separate the effect of circulating ANGPTL8 on adult beta cell proliferation vs direct delivery targeted to the beta cells. The advantage of beta cell targeting is an avoidance of adverse systemic effects such as hypertriacylglycerolaemia. We used UTMD to deliver human ANGPTL8 to the liver and skeletal muscle of normal adult rats, and human ANGPTL8 was clearly detected in the rat circulation for 1 month. We also observed that 5–7% of normal adult beta cells were proliferating 1 month after UTMD. However, ANGPTL8 targeted to liver and muscle caused severe hypertriacylglycerolaemia even in normal rats. Conversely, when ANGPTL8 was targeted to rat pancreatic islets using a modified insulin promoter, beta cell proliferation was observed without hypertriacylglycerolaemia. Interestingly, this was also able to trigger relatively low-level beta cell proliferation in aged rats, which have previously been shown to have limited proliferative activity of their pancreatic beta cells . Gusarova et al  recently reported the delivery of ANGPTL8 to mouse liver with a transient expression plasmid (pRG977), and concluded that ANGPTL8 does not control pancreatic beta cell expansion 7 days after hydrodynamic tail vein gene injection. Moreover, in mice devoid of ANGPTL8 expression there is an unchanged ability to increase beta cell proliferation following S961 treatment. Hence the S961 effect on beta cells occurs in the absence of ANGPTL8. However, Mitsui et al  reported that the peak of expression of this transient plasmid in mice liver occurs 24 h after hydrodynamic tail vein gene injection, with only 0.1% of luciferase activity remaining 7 days after injection. Our study supports Melton’s data [12, 29] that beta cell expansion is promoted by durable ANGPTL8 stimulation after highly efficient transposon gene delivery. It is not known whether ANGPTL8 therapy has any therapeutic benefits in diabetes, but our data show that ANGPTL8 delivery improves but cannot reverse STZ-induced diabetes. Potential reasons for this include the fact that rats with STZ-induced diabetes do not have enough beta cells to undergo replication in sufficient numbers that will reverse the diabetes. In addition, beta cells may be dedifferentiated due to the toxicity and/or inflammation seen in the diabetic state . This work was supported by the Mark Shepherd Endowment of The Baylor Foundation (PAG) and the National Natural Science Funds of China (81420108018) (PH). PAG was responsible for the conception and design of the study, acquisition and analysis of the data and drafting of the article. JC, SC and PH performed data acquisition and analysis and contributed to writing the manuscript. JS, XM and SC made substantial contributions to the conception of the study and critically revised the manuscript. PAG is the guarantor of this work and as such had full access to all the data in the study and takes responsibility for the integrity of the data and the accuracy of the data analysis. All listed authors approved the final version of the manuscript.